I have had my eye on the Frigidaire GLEH1642F for a while and i recently pulled the plug on my wold washer and dryer and upgraded to this dream machine it. takes in less water making my water bill a lot less which right off the top i loved, and so did my wallet. Its fix nice right in the place were my old washer was and with the added room i save it was a great idea. I can now use the extra room to iron and do other things. The other great thing about this is that it has a sensor that lets the machine know when things are dry before its time so it just turns off and saves you money on the electric bill its like having a small accountant in the machine that only wants to save you cash i love this thing i can't say more good things about it. Aside from all that it also have a large capacity so i can put my large item s like my med size rugs or a large quilt that always in the closet and only comes out on the coldest of nights. But there is a down side and its the slow drying time it takes for ever to dry but that's not as bad as the fact that its loud like a old women yelling at a ball game i can hear it when am not even in the same room. But other then that i think its a small price to pay for a combo that looks out for every penny and cent and makes for a great item to have. So if your in the market for a combo think you'd be happy with this one sure it makes a sound or two when its working but its working and its doing a great job, I'd be scared if i didn't hear anything i would always be thinking its done or broken and not working so it ll depends if your a glass half empty kinda person or a half full kinda person. I have had this unit since 08/2009 and never a moments trouble. May be the best washer/dryer I've ever owned. I try my best to keep my footprint small and bought this unit in preparation of downsizing. It uses very little space, very little energy and it just work! Can't get much better than that! This combo unit has a large load capacity, which is not always found in many combo units. We were pleasantly surprised with how much laundry could fit into a single load. The unit is also very energy efficient. It has a moisture sensor on the dryer section so that it only runs as long as it needs to go. The washer is a front loader so it uses less water for each load. On the flip side, the dryer does seem to take a while to finish up. They do sell a model that requires a gas hookup as well, but we only had an electrical socket where the dryer was to be placed. Also, we had this located near our baby's bedroom and the buzzer signaling the cycle is complete was pretty loud and I couldn't adjust it lower. The longer drying time is something that I got used to and think is a worthwhile trade for the overall performance of this combo unit. I would recommend this combo unit to anyone interested in purchasing a new system. I rent an apartment, and was initially disappointed to see it had a washer/dryer combo instead of the full size units. However, now that I've used it, I am very impressed with the performance. Unlike other combo units I've used in the past, the Frigidaire can handle much larger loads of laundry. This is one of the most convenient washer/dryers I've used because of its available capacity, but also due to the fact that it is very easy to use. The washer is front-loading, which I find to be more convenient when loading my laundry into the machine. The only complaints I have about the unit include the loud buzzers that go off periodically throughout the cycle. Unfortunately they cannot be turned off, and they are rather annoying, though if I just close the closet door and am watching TV or in another room I often don't even hear them. In addition, I would prefer for the dryer to work a little more quickly as drying times do seem longer than they have from other washer/dryers I have used in the past. However, the machine does include a moisture sensor that triggers the dryer to shut off once clothes are dry in an effort to conserve energy, which I find to be a good example of the company's conscious effort to save/conserve energy. 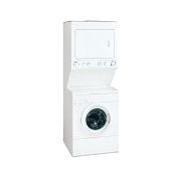 I would recommend this product to anyone who needs a solid washer/dryer unit and does not have any space to waste. Overall I've been happy with the product, although in the end I suppose I'd still rather have the full size unit! Join in and write your own page! It's easy to do. How? Simply click here to return to Frigidaire Washer Dryer Combo.